Our Most Popular Clear Skin Resolution Tips for 2016! With 2015 reaching its end, many people like to reflect on all that has happened in the past year. The change in dates also offers us an opportunity to look forward to the future, setting goals and making resolutions to improve the quality of our lives in both small and larger ways. Because maintaining healthy skin is work like anything else, setting attainable goals can go a long way in achieving measurable improvements. Over the course of the past year, we have shared many blog posts with you, detailing the best ways to achieve and maintain healthy, acne-free skin. All those tips, tricks, and information can serve as your guide and support system in choosing the best ways to meet your skincare goals in the New Year and beyond! Here are some of our top skincare habits. Adding any of these to your New Year’s resolutions will help you meet your skincare goals for the New Year! You Are What You Eat: Keep healthy eating habits! We’ve said it a million times and we’ll say it again - treating acne is an inside job! Although food does not cause acne directly, certain foods can lead to hormonal changes in the body, which may impact the acne cascade. Since the key to keeping New Year’s resolutions is setting reasonable expectations, we suggest eating less of the bad stuff, and more of the good, trying always to do your best. Replacing processed foods high in sugar (or worse, high fructose corn syrup), preservatives, and additives with vitamin-rich veggies, fiber-rich fruit, omega 3-rich nuts, wild caught fish and organic lean meat contributes immensely to a healthy body and clear skin. Clean Your Skin From Acne: By keeping it clean! Acne symptoms are due in part to clogged pores. The “inside” contribution to the clogged pore is the overproduction of sebum, which can be related to a hormonal imbalance. Dead skin cells, dirty bacteria, and pore-clogging makeup are responsible for the “outside” contribution to the problem. Preventing new breakouts starts from within, but it would be foolish to say that our skincare routines don’t play their part in the process as well. Our pores are only as clean as the surface of our skin, which is why it’s important to be aware of what touches our complexions. Keeping hands, makeup brushes, towels, linens, and especially pillowcases clean will ensure that pores are clean, ultimately leading to clear skin. Rome was not build over night! Neither was a clear complexion! Be consistent, keep your acne-free routines and stay on course! The only way to get better at something is to practice, and creating a routine makes building a new habit feel less like work, and more like a regular part of your day. Acne doesn’t appear overnight and treating it certainly doesn’t work that way either. It’s important to remember that consistent application is the key to real change! Whether you’re looking to exercise more often, get more sleep, drink more water, or simply make healthier eating choices, it’s important you don’t get discouraged if the going gets tough or if you feel you aren’t seeing results right away. You deserve to experience the reward of all that hard work, so if you slip up, you can always start again. It’s just important that you never give up! Want Clear Skin For GOOD? 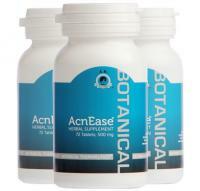 Don’t just TREAT acne - PREVENT IT! The only long-term solution that will keep your skin looking and feeling its best is to prevent acne before it starts, which means – breaking the acne cycle and this is exactly what AcnEase® does. Using 100% safe, all-natural ingredients, AcnEase® works to restore the internal balance and correct the factors that cause pimples to form, while treating existing pimples simultaneously. Now, we know you of course want to eliminate the symptoms you’re dealing with (which AcnEase® is designed to do as well), but again, if you don’t use a treatment designed to break the cycle, the vicious cycle will continue! The most important point to remember when making and keeping New Year’s resolutions is that we set ourselves up to succeed. Setting measurable, attainable goals can go a long way in realizing and achieving our plans and goals. Instead of aiming for a total lifestyle overhaul, just try to focus on one or two small changes that you can make regularly. Rather than saying, “I want to eat healthier,” try saying “I am going to eat two apples a week.” When you master this small change – move to another. Stress can do more harm to our bodies than most people realize, including contributing to acne, so aim to keep stress levels low by making your resolutions easier on yourself! Remember what Ovid, a Roman poet, said almost 2000 years ago: Dripping water hollows out stone, not through force but through persistence. Let our persistence in shaping “good” skin habits lead to clear, beautiful skin in 2016! We want to hear from you! What are some of your New Year’s resolutions? Do you have any skincare goals on the list this year? Tell us in the comments below!